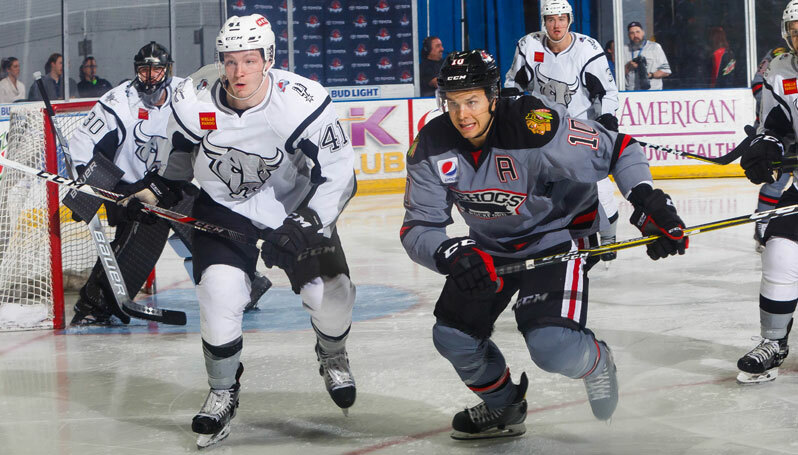 ROCKFORD, Ill. – The Rockford IceHogs scored four unanswered goals in 8:13 and held off a comeback from the San Antonio Rampage for a 4-3 victory at the BMO Harris Bank Center Sunday night. The IceHogs treated a crowd of 5,544 to their first victory in five outings. Nathan Noel notched the game-winning goal – his first goal in the AHL – to cap Rockford’s hot stretch just over two minutes into the second period. Alexandre Fortin forced a turnover on the forecheck that sent the puck straight to Noel in the slot to give Rockford a 4-1 lead at that time. Luke Johnson, Henrik Samuelsson and Tanner Kero each found twine as well for the IceHogs earlier in the game. After ceding a quick goal to the Rampage after the start of the contest, Johnson corralled a loose puck off of a Matthew Highmore deflection and wired a shot into the open cage to even the score at 14:20 of the first period. Samuelsson then provided the go-ahead goal as he carried the puck across the top of the faceoff circles and ripped a shot past San Antonio’s Spencer Martin with 3:50 remaining in the opening frame. Samuelsson’s goal was his third of the season, and he has now tallied in each of the three games he has played for the IceHogs. The IceHogs continued their blitz in the second period, as Kero posted his seventh goal of the season just under a minute before Noel bagged the game-winner. William Pelletier fed Kero with a pass behind the net, which he then stashed past Martin 1:38 after the drop of the puck for period two. The Rampage later struck twice to cut the Rockford lead to one, but netminder Collin Delia withstood the onslaught, turning aside 25 of 28 pucks. San Antonio goaltenders Spencer Martin and Ville Husso combined for 24 saves on 28 shots. The IceHogs welcome the Texas Stars to the BMO Harris Bank Center for a Fas Fuel Winning Weekday at 7 p.m. Fans can enjoy discounted hot dogs, select beer and companion tickets. If the Hogs win, tickets from Wednesday’s game can be redeemed for a ticket of equal or lesser value to the following Fas Fuel Winning Weekdays game on Tuesday, March 13. Former Chicago Blackhawks defenseman and Stanley Cup champion Brian Campbell will also be in attendance, and a select number of fans will have the chance to get an autograph. Tickets can be purchased at IceHogs.com, by calling (815) 968-5222 or in-person at the BMO Harris Bank Center Box Office.